TO IMPROVE A PATIENT'S QUALITY OF LIFE. Dr. Ndidiamaka (Didi) Okpareke began her professional career after graduating with honors from the University of New Mexico College of Pharmacy, class of 2008. She has extensive experience in hospital and retail pharmacy, with a firm knowledge in pediatric, neonatal, general surgery, and geriatric pharmaceutical care. She embarked on her dream to become an entrepreneur in January 2016, and her vision is to ameliorate the provision of customized pharmaceutical care, one client at a time. Dr. Okpareke is a treasured mother, daughter, sister, and friend. In her free time, she enjoys traveling around the world and playing soccer with her three young children in their neighborhood park. Olive Tree Compounding Pharmacy GRAND OPENING!!! Olive Tree Compounding Pharmacy on KUNM live!!! 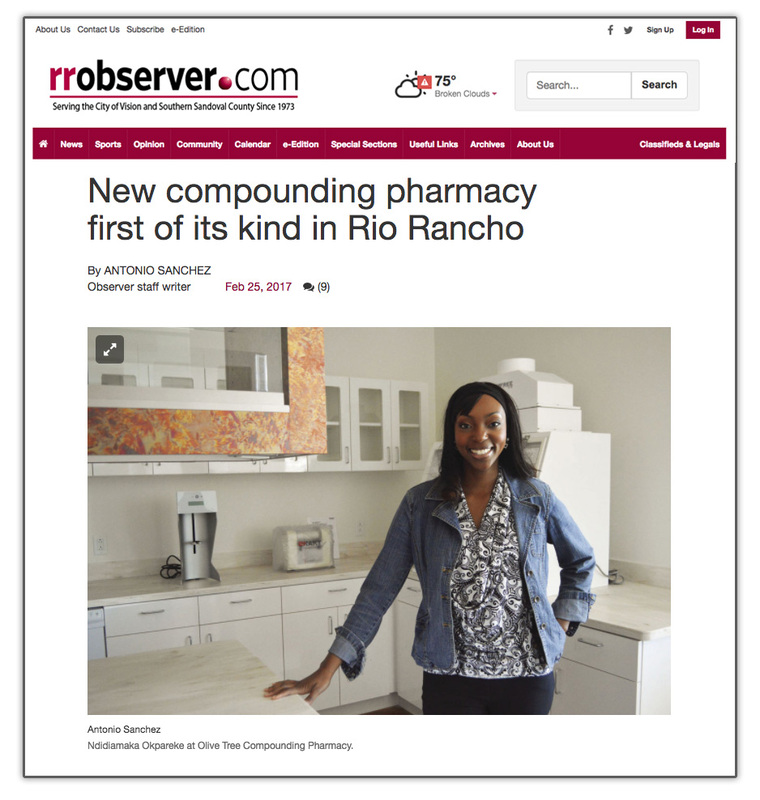 Olive Tree Compounding Pharmacy in the Rio Rancho Observer!!! Whether presented as a pill or as chewy gummy bears, compounding pharmacist Ndidiamaka Okpareke would like to help her Rio Rancho patients take their medication with ease. Olive Tree Compounding Pharmacy, located in the Unser Gateway at 1920 Westside Boulevard Suite B, opened their doors for the first time earlier this month. Okpareke, owner and pharmacist at Olive Tree, said the location was the city’s only compounding pharmacy.